Bon Bon Candy Store is filled with local, fresh fudge and treats! We just finished putting the final touches on Bon Bon Candy Store transforming it into a winter wonderland. Step inside and feel the magic, enjoy a local sweet treat. Our wonderful staff is here waiting to help you find and ship the perfect holiday treat! 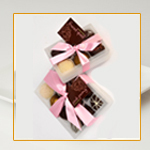 ‹ We Ship your gift of BonBon Fudge!